KATERYNIVKA, Ukraine -- A single crack of an automatic rifle shattered the tomb-like silence of this no-man's-land village in east Ukraine. 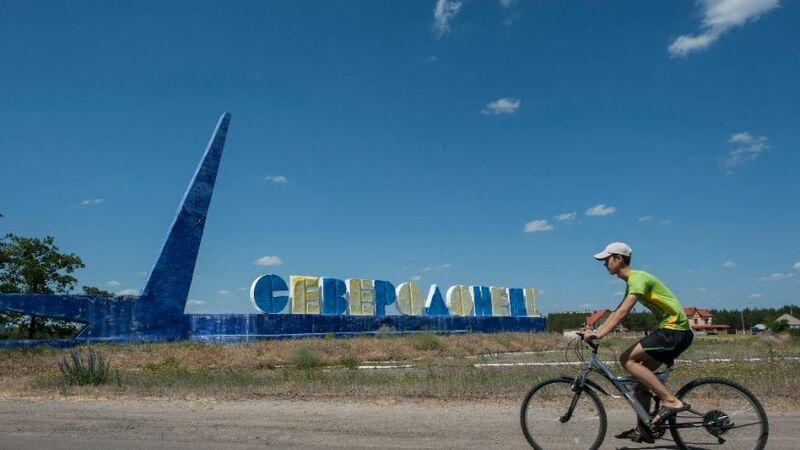 In this photo taken on Thursday, June 11, 2015, a boy rides a bicycle past the sign reading "Severodonetsk" in the town of Severodonetsk, Luhansk region, eastern Ukraine. Pro-Russian sympathies have historically been strong in a region where Ukrainian identity has tended to be much weaker than elsewhere in the country. The gunshot, fired in error by a jumpy soldier, sent government border guard troops on patrol this week scrambling to brace against the ambush they expect every time they venture into Katerynivka. The men said that four of their fellow soldiers were killed in a recent clash with separatist rebels. "Katerynivka is nominally the territory of Ukraine, but for the time being it is just a buffer zone where there could be bandits and separatist militants," said Pavlo Petrovich, known to fellow soldiers by the code-name Papa, a border guard service volunteer from the western region of Chernivtsi. What Ukrainian troops call a buffer zone is a village of a few hundred people stretched along a corrugated dead-end country lane hemmed in by heaving trees. Most of the young, fit and able have long left, as one nervous resident explained. "I lived here with a son, a daughter-in-law and their child," said Pyotr Vladimirovich, dabbing sweat from his sun-roasted brow. "I am the only one left. I can't just abandon everything." For groceries, residents venture to the village shop, which remains open only until lunch. After then, few dare to brave the outdoors. "I just take care of the property, there's nothing else to do," said Vladimirovich, who worked as a bus driver before war broke out. Water is drawn from wells, while electricity is still provided without interruption. The sound of shelling begins as dusk nears. Katerynivka has been spared much direct damage and the projectiles largely whistle over to fall closer to Ukrainian positions a few minutes up the road. Still, venturing around the village is fraught with risks and any false step is potentially life-threatening. Over the weekend, a local 54-year old cowherd was hospitalized with grievous shrapnel wounds after setting off a tripwire while leading his animals to graze. The homemade explosive device was made with a coil from a spring mattress. Ukrainian soldiers say it was laid by rebels, some of whom they say are likely from the village. "Most of the healthy male population is fighting on the side the LPR," said Papa, using the initials of the self-styled breakaway Luhansk People's Republic movement. "They remain in communication with their families and sometimes carry out attacks on our checkpoints." Until a few weeks ago, people could travel to and from separatist areas by driving along road running past the turnoff to Katerynivka. Soldiers guarding the way now turn back all traffic. As the 450-kilometer (280-mile) line separating government and rebel territory began to evolve into a fixed feature last year, Ukrainian authorities created an unwieldy system of permits for movement from one zone into the other. With fighting surging again near the main separatist stronghold, only one of the corridors has been left open in the two separatism-plagued regions of Donetsk and Luhansk. Things are arguably harder in Luhansk region, where the irascible governor, Hennadiy Moskal, has decreed that no civilians are any longer allowed to travel between government and rebel-controlled areas. "Why should I let people go through, just so they can get fired at with grenade-launchers and machine guns?" Moskal said. "I have responsibilities before the president, the government and the people of Ukraine to preserve lives." As the eponymous regional capital of Luhansk is held by separatists, Moskal is forced to run his office out of the relative backwater of Severodonetsk, where livelihoods have revolved since Soviet times around the local chemical factories. Only 30 kilometers (18 miles) from the front line, the town is blissfully somnolent and thoughts of war appear distant. Children tug at the branches of mulberry trees whose fruit otherwise drops to the ground to stain the sidewalks layered in fluffy poplar seeds. A pedestrian area along Lenin Street is a magnet for young mothers pushing buggies. In the early summer midday sunshine, few stay outside for long though. But if formal control over Severodonetsk is more clearly defined, uncertain popular loyalties make it no less an ambiguous quantity than Katerynivka. The town came under the sway of armed rebels for a brief period last year — long enough to ensure presidential elections in May could not be held there. On the face of it, things have changed. Severodonetsk sports hallmarks of a more fervently patriotic new order. In front of the imposing, colonnaded House of Culture building, a plinth once topped by the statue of Vladimir Lenin, the Bolshevik leader reviled by Ukrainian nationalists, stands empty save for the national blue-and-yellow flag. A craze has swept through Ukraine for the removal of Lenin monuments, regardless of abiding fondness among many elderly people for the communist era. The ties that bind the region with Russia — whose strong role in organizing and supporting the separatist movement is widely accepted — are still readily apparent. Advertising notices glued to lampposts and noticeboards almost all offer holiday packages to Russia's south. Economic ties are being made into a formal reality in rebel areas, where pensions have started to be paid in Russian rubles. The currencies of Ukraine and Russia are used interchangeably in the separatist fiefdoms, with the latter said to prevail where militiamen from Russia have gathered in large numbers. Pro-Russian sympathies have historically been strong in a region where Ukrainian identity has tended to be much weaker than elsewhere in the country. 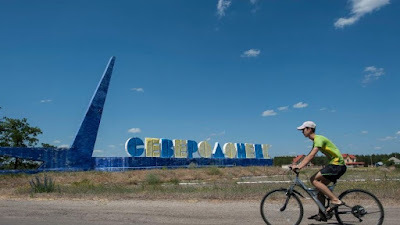 Russian is spoken almost universally and if Ukrainian is heard in towns like Severodonetsk, it is now more likely to be coming from the mouths of troops garrisoned there. Soldiers are viewed with resentment, not least for their not infrequent propensity for aggressive boozing, which has led to a blanket ban on the sale of alcohol to troops. A trio of disappointed and empty-handed men in military fatigues observed Wednesday trudging from one shop to another in Severodonetsk suggested liquor vendor are holding up their end of the bargain. Residents of Severodonetsk whose lives have been disturbed by the unrest are less interested in the politics behind their predicament than understanding how to negotiate their plight. There is resentment at the arrival of those fleeing their homes because of the upward pressure they have applied to apartment rental prices and groceries bills already inflated by a depreciating currency. Meanwhile, the displaced feel as trapped as anybody in Katerynivka. The blockade championed by Moskal does not go down well with people like Vladimir Nikolayevich, a 56-year old doctor, who was compelled by shelling to abandon his hometown of Pervomaisk, now in rebel territory. "We have passports. We are citizens of Ukraine," he said. "That should be enough to get through."